What's happened now is they are in a position where that leased gold is being asked for and they don't have it. I know of a very large client who actually turned up for his bullion, was refused his bullion, and told he would be settled in cash. I felt I should go public with that (on KWN). ...(ABN AMRO) really was the tip of the iceberg. What happened was that we saw that first bullion bank create the first visible default of the LBMA fractional reserve system. I hear of other clients who are now panicking, and what happens? You get an official intervention. That what it (the take down in gold and silver) was all about." I believe there was at least one of these events Maguire describes that took place in the lead up to the crashing of the gold and silver markets. Earlier in the year, the Bundesbank asked for its gold back only to be told that they would get one-seventh of it over a seven-year period. But it's supposed to be all stored at the Fed, is it not? Of course the gold isn't there -- or, if it is, it has been leased out and backs a number of fraudulent tons of paper that supposedly sit on the balance sheets of ETFs and commodity exchanges. Then we get the report that Maguire alluded to in the quote above that ABN AMRO, the Dutch repository and bullion bank, would not honor redemption calls for physical gold and settle its clients in cash. No big deal right? Why is that? Why were they unable to produce the physical gold they had been charging their clients storage fees for? When the bail-in of Cyprus took place and the trust in the banking system was lost bank runs began all over, including the bullion banks. Those that thought they owned gold came to find out that they actually didn't and were handed dollars or euros (NYSEARCA:FXE) at what amounts to stink-bid prices. The worst part about this situation is that the gold will not only not be delivered but it will also still be available to be used to "back" the current securitization Ponzi scheme that has been setting the price. In the gold community we have been saying for years for longs to stand for delivery. Make them prove they have the gold they say they have at the prices they are trading it. 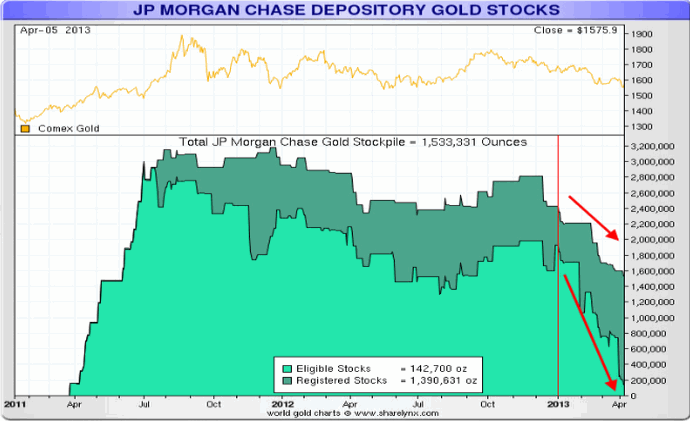 Some of us have taken a lot of heat for saying that this strategy will result in the price of gold skyrocketing. Of course, as it turns out, those that have the most to lose over that happening would exercise every option they had before allowing that to take place. Hence, the raid last week on the gold and silver pits. In my last article, I gave credence to Jeffrey Snider of Alhambra Investment Services for his great work in correlating shifts in repo collateral with massive changes in the price of gold. I don't doubt that what Snider argues has some validity. I only then ask the question, "Cui Bono from the drying up of repo collateral?" Who benefits? And how hard would it be to create the collateral panic necessary to begin the process? Correlation does not imply causality, and the amount of selling necessary to create the drop that occurred would have needed to attack from multiple fronts. This article over at Futures Magazine by Bill Downey should dispel a number of myths that the attack on gold was not only coordinated but underhanded. As he describes something I have not heard anywhere else at this point, that the physical buyers were shut out of the market during the crash. The physical trading network failed -- ascribe whatever reason for its failure you want -- and locked out the physical buyers from coming in to support the price. 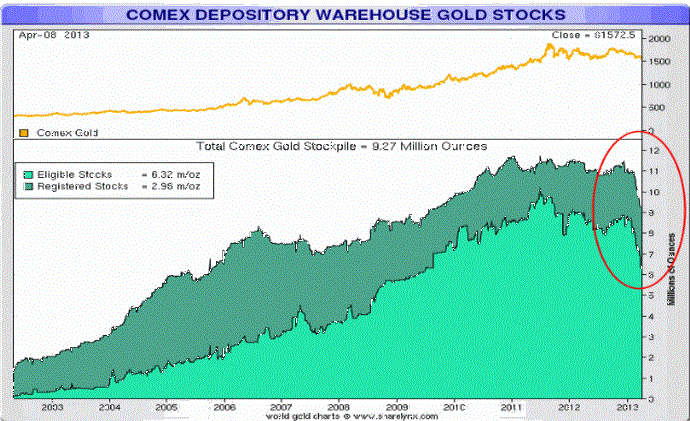 I'm reprinting the two charts that should help give some context to the magnitude of the physical delivery problem for the bullion banks and the LBMA (charts courtesy of Nick Laird at sharelynx.com). At some point, faith in the paper gold system will fail completely and when it does it will not be able to set the price. I have been saying all year that if the price of gold had been taken to these levels it would do irreparable damage to the markets. With gold pushing back above $1,400 and with silver struggling to break convincingly over $23.50, the near-term picture -- as always, given the current disposition of the market -- is mixed. There is tremendous open interest in silver open for May delivery -- 44,114 contracts as of tonight -- which begins in just six more trading days. That's 220 million ounces of potential physical demand on May 1. The rollover rate out of the May contract has been between 2,000 and 4,000 contracts a day. That will have to accelerate or we will be hearing of the COMEX settling May silver contracts in cash as the exchange only has 165 million ounces in inventory. Is anyone surprised that silver cannot break higher? Honestly, I never thought that we would be at this state. I've considered it a possible outcome, but not a highly probable one. While I may disagree with the monetary powers-that-be, I never thought of them as stupid. The tactic has been to let gold rose steadily while bleeding off the debt burden with time. So, when thinking about the upside on the gold bull market $4,000 to $6,000 per ounce was always in my mind. But the misstep in Cyprus has changed things. There will be no easy way to settle things down now that the loss of confidence and trust exists at all levels of the market, not just with the powerless. The resulting demand for physical gold will not abate even with force majeure settlement in fiat like with ABN AMRO. In fact, it will probably intensify. Disclosure: I have no positions in any stocks mentioned, and no plans to initiate any positions within the next 72 hours. I own physical gold, silver, and a few dairy goats specifically for times like these -- protection. I wrote this article myself, and it expresses my own opinions. I am not receiving compensation for it (other than from Seeking Alpha). I have no business relationship with any company whose stock is mentioned in this article.